Chilli & basil stir-fried prawns This was a delicious and quick recipe. The sauce tasted like much more than the sum of its parts. The only red chilli ( that's how it's spelled in the recipe) I could find was habanero which is way up there on the spicy scale for me, so I used less than called for in the recipe. Will make again. p. 36 - March 2010: First use of this recipe. Good results were attained but only with modifications to recipe. Acid/oil ratio in recipe is off. If a cook used the 1/4cup of lemon juice required in the recipe they'd need 3/4 cup olive to off-set this acidity (not 2 tbsp as set out in recipe ingredients). This would produce far too much dressing for this salad. I used 2 tbsp lemon juice and 6 tbsp oil. I also added some lemon zest and, roughly chopped black olives. I'd use more capers next time around and, would also substitute baby shrimp for the tuna to have another option. This would also be good with some minced Thai bird chilies for an extra kick. Topped w a light dusting of parmesan grated w a rasp. This was quick and easy and just ok. The mixed greens we used dominated all the other flavors so it might be better with some milder-tasting salad greens. Nice fall flavors! Love the combination of mushrooms with goat cheese. Will make again. This is a real instant recipe. The sauce can be made while the pasta is cooking, great way to use up some leftover ricotta. We all liked it even though I forgot to add the basil in the end. A keeper! The spinach and smoked salmon variation is delicious. Nice for a quick weeknight meal. I didn't care for this. The flavor of the fish sauce was too strong and wasn't balanced by other flavors. I did have to reduce the lime juice by a third as I ran out but I don't think that would've helped the overall flavor. Cooking time is key for risotto and this recipe isn’t ‘set and forget’ like many baked dishes: you have to judge when to add the frozen peas, when to add the Parmesan, and then when to stop cooking. I found a clear casserole lid was more useful than foil for checking this. Also if it looks like I’m running out of cooking time I skip the frozen peas stage, and simply thaw / warm them and add them with the cheese towards the end. Good and simple weeknight friendly recipe. Paste will darken as the sugar caramelises. Added chopped unsalted peanuts over the top at the end. Could use just a bit of salt in the paste to boost it up - maybe 1/2-1 tspn. Will try to add handful of beanshoots at the end next time and serve with coriander. Have made several times already - big hit with the whole family. 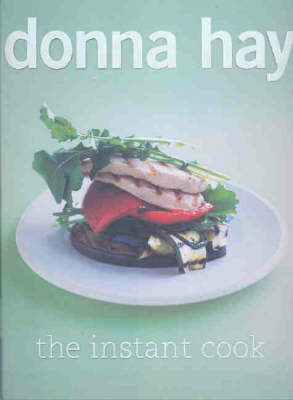 Whether you need to whip up busy midweek fare for a famished family or present something chic and easy for a casual weekend dinner with friends - time is on your side with Donna Hay's latest collection of over 190 fast, new and inspiring recipes, tips and tricks. Enjoy the fastest pasta around and make scrumptious dishes and sauces in minutes. Donna Hay again gives her readers the know-how and confidence to create great meals that are filling and substantial at short notice. Each chapter begins with a personal note from Donna on the recipes ahead in a classic collection of chapters - soup, salads, pasta, rice and noodles, chicken, meat, fish, seafood, vegetables, and sweets.